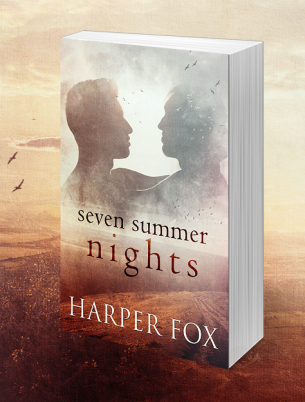 Seven Summer Nights is another wonderful novel from Harper Fox — a complex weave of archeological and mythological mystery, the after-effects of war and post-traumatic stress, and a passionate love story. This book filled me with wonder and fear and horror and joy as we follow the story of Rufus Denby, a celebrated archaeologist and WW2 veteran, whose PTSD and amnesia are giving him nightmares and violent blackouts, leaving his career — and his life, really — in tatters. The first two-thirds of the novel, which is set in the summer following World War Two, are told in third-person from Rufus’s point of view (Part 1 – Into the Labyrinth). He’s broken and desperate, barely holding on, when he travels to the tiny Sussex town of Droyton Parva to take a look at its ancient church. There he meets the Reverend Archie Thorne, a most unconventional vicar who loves motorbikes and cars, and housing people who have nowhere else to go. Archie is far from the crusty religious specimen Rufus expected to encounter, and the two strike up a friendship based on Rufus’s ability to fix Archie’s Norton motorbike and Rufus’s work at the church. Rufus’s discovery of an ancient and important artefact in the church, along with his interpretation of some of the murals, set off a chain of mystical events and archeological discovery that are simply thrilling. (Several of Harper Fox’s works involve archaeological and/or mystical themes, and they are among my favourites. For example: The Salisbury Key, the Tyack and Frayne series, even In Search of Saints.) As with all Harper Fox’s work, the setting of Droyton Parva (and its various inhabitants) is fabulously well-drawn and forms the heart of the story itself. Woven through and around this is another plotline revolving around Rufus’s wartime experiences and a memory he has suppressed involving his deceased brother-in-law. The effect this has on Rufus’s mental health, and the pressure brought to bear on him to undergo shock therapy to retrieve the memory, plays out beautifully through part 1 until Rufus finally cracks. I particularly loved the labyrinthine theme woven through both these plotlines, which binds them together tightly. And then, of course, there’s the beautiful, slow-burn romance between Rufus and Archie. (Although, since it happens in just ‘seven summer nights’, I guess it’s not that slow.) Rufus is about as openly gay as you could get in the 1940s — which is to say, not at all, but he has lived with a man in the past, and a few trusted people know his orientation. He starts falling for the adorable Archie almost right away, but they are hindered by general bigotry and fear of arrest if such proclivities are discovered. Needless to say, they find each other eventually and Archie’s care and compassion for poor, broken Rufus is heart-meltingly beautiful. Here, I loved the recurring use of one of W.H. Auden’s poems, quoted between Rufus and Archie. Which brings me to Part 2 – Into the sun, comprising the final third of the novel. Having written such a masterful, tightly woven piece to the end of part 1, I can imagine the author tearing out her hair trying to figure out how the end should play out. And so we switch to Archie’s point of view, first as he charges to Rufus’s rescue, and then as the church mysteries play out. If I’m honest, part 2 didn’t resonate with me to the extent part 1 did. It’s action-packed, dramatic and eventful… and everything is wrapped up in a satisfying conclusion. And I absolutely love the fact this labyrinthine tale curls around on itself at the very end. However, part 2 somehow lacks some of the magic of part 1. Despite being mostly in Archie’s point of view, I didn’t feel as though I got enough new depth of insight into his character — although he does prove endearingly resourceful and determined and loyal. I think, after experiencing Rufus’s painful journey in part 1, I wanted to be in his perspective as the big events played out and resolved. Rather than the tightly woven tale of part 1, part 2 events played out in more linear fashion… I think maybe the amnesia plotline got a bit too complicated for the story. But these are minor quibbles, really. Seven Summer Nights is still a fabulous book, even if part 2 doesn’t quite stand up to the marvellousness of part 1. It’s rich in theme and history and language and complexity and character. It has a large supporting cast of characters, all well-drawn with a part to play. And, unlike many male/male love stories, a huge number of the supporting cast are resourceful and independent women. In fact, this is another theme explored in the novel — the effect of WW2 on the role of women in Britain. Yes, there is a huge amount of stuff going on this book! I could keep going on about all the wonderful layers in Seven Summer Nights, but it’s probably better if you just go read it. Highly recommended. I’m going to have to read that one, aren’t I? Absolutely! Need you even ask?